To learn more about colon cancer including symptoms, treatment, and clinic information, click here. If you would like to support research on this disease, please fill out and submit the donation form below. This is a security measure to help prevent fraud. Unable to load the reCAPTCHA image. The public key (6Lc2ML8SAAAAADPI4McEoAU5TWX-FEwsIihSPj2E) might be invalid for this domain. We're a part of the UT Health San Antonio, provider of comprehensive health, dental, & cancer care, advanced academics, and life-saving research. 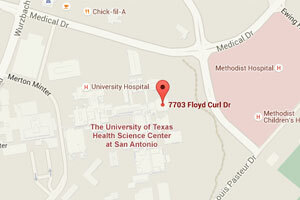 Links from web sites affiliated with The University of Texas Health Science Center at San Antonio’s web site (www.uthscsa.edu) to other web sites do not constitute or imply university endorsement of those sites, their content, or products and services associated with those sites.